Vermont is a bloody nice place. Nice people. 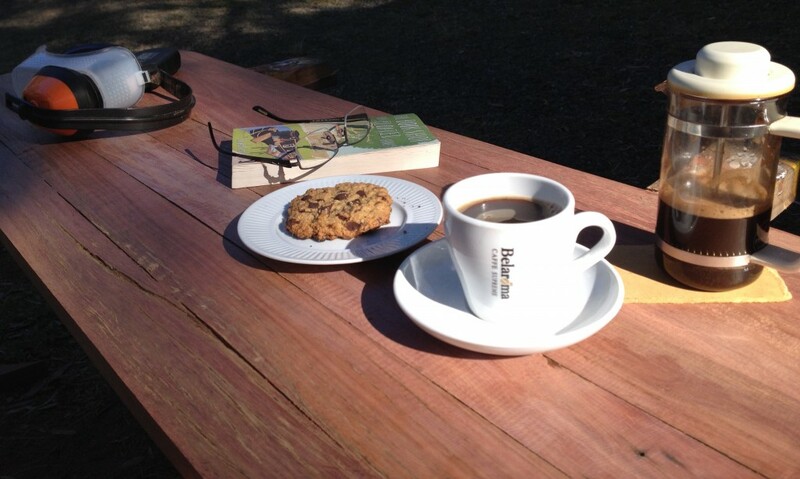 Nice coffee. Nice environment. The ONLY state in the USA which has a state capital (Montpelier) which does not have a McDonalds outlet in town. I mean…how good is THAT! I particularly recommend the Rivendell Book shop there as being a very cool little bookshop selling a mix of new and second hand titles, which also features highly knowledgeable staff who can find a second hand copy of Finnegans Wake in an instant, without resorting to looking on the computer to see if they have it in stock and if so where in the shop it might be. The shop also has a very happy looking turtle in a large tank in the rear children’s book room. You don’t get that buying books through Amazon.com. Vermont was also the birthplace of Edward John Phelps. 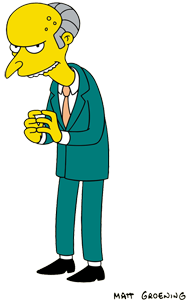 Edward was a man of excellent whiskers, crinkly laugh lines around his eyes, and a habit of quoting other, similarly whiskered men, for example a certain William Connor Magee. Despite appearances ol’ Billy Magee was no fool, and he is famous for saying “The man who makes no mistakes does not usually make anything”; exactly the words that Edward would quote some years later. And so it is that via a circuitous route we come to the postmortem of the coffee table construction, for it certainly was not without the making of mistakes. To be fair, the only “formal” learning I have received concerning woodwork came in the form of a woodworking class I took in Year 9 or year 10 in High School, and I can’t say I was “Top of the class”. Still…life I think can make one more practical as time goes by, and so those long ago learned basics are perhaps today augmented by a little more common sense and a set of basic tools with which practice has made me familiar, plus some feeling of security that comes from the knowledge that any mistakes made are mine alone and won’t be counting toward a dreaded school report at end of term. 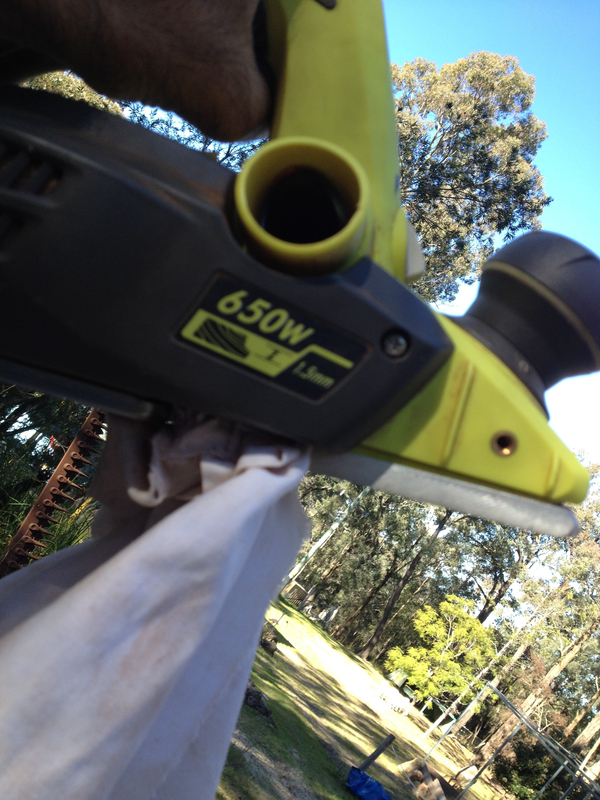 Keep a wider separation between random bits of cloth and electric planers. Even when knowing which way I wanted the legs glued, slap myself a few times before drilling and gluing them together. Work out some way of rigging up a planing jig (without having to buy one) so that I could have finished the timbers for the top slab to D.A.R. state ie. planed to squared dimensions. The individual strips within the edge-dowelled slab don’t quite come together in some places as the sides were planed to eye-sight not in a jig. Overall this looks OK as the finished piece has a deliberately “organic” shape anyway, but having the timbers D.A.R. would have been nice. Cutting to length braces that match the distances between the leg cuts on the bottom shelf, allowing the legs and shelf to be (dry) clamped to the exact dimensions, using the braces to keep the correct distances between the leg pairs before drilling the dowel holes in the tops of the legs and then in the top slab. Despite the best care somehow the legs ended up moving out a little during this step, thus the cut-outs in the bottom shelf each have about a 1.5mm gap instead of each leg being tight into its cut-out. That said, I am happy with the outcome. It is nice to put something down on that table and know that it is a product of my own effort, and not something that has been spat out at volume from some distant, anonymous factory. 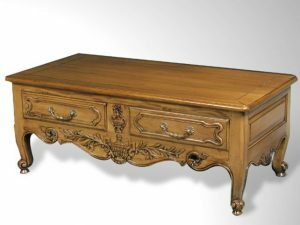 It is also nice to know that this piece of furniture has not required the felling of some new forest in order to make it, as it is (mostly) a product of re-using old timbers. 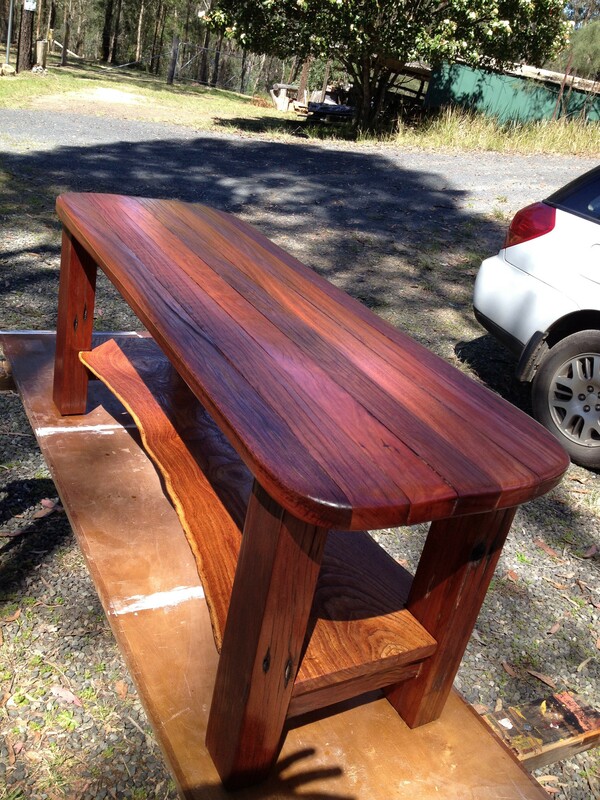 Finally, it is good to take some old piece of timber and turn it into something useful. Thus life’s circle turns and what was ageing and passed it’s first purpose has become something new. Clamps Off. Linseed on. Ta-dah! Time to dust off the tools and replace those buggered legs. Here are the two, glued and finish-sanded sets of legs. Sadly there were no more “nice old bolt holes” to be had, but each leg features a couple of nail holes, from which the nails have been pulled (well….”mostly pulled” as a few snapped off despite the best of care). Next step is to trim a slab of White Cedar that was gifted to me a number of years back, and which will form the bottom shelf of the table – as well as doubling as lower bracing between the leg-sets. 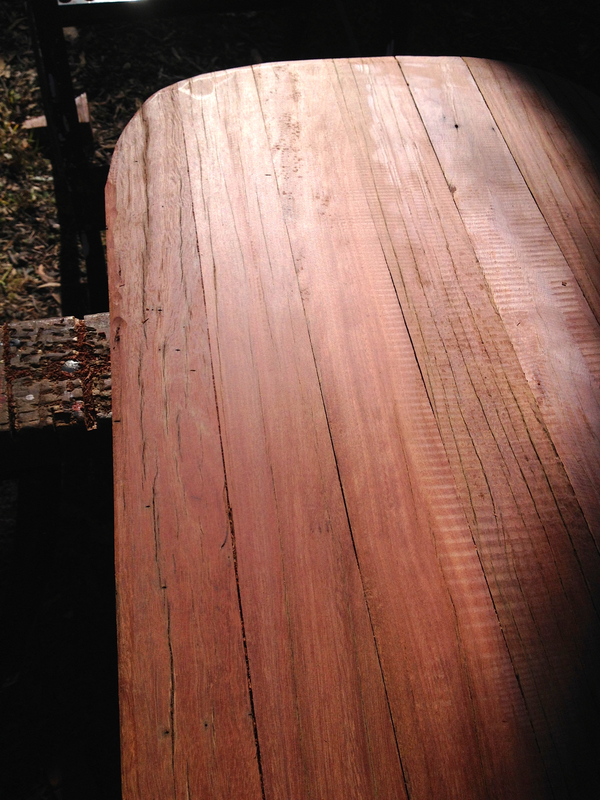 After cutting the cedar slab has then been sanded with 80, 120, 240 and 280 grade paper. 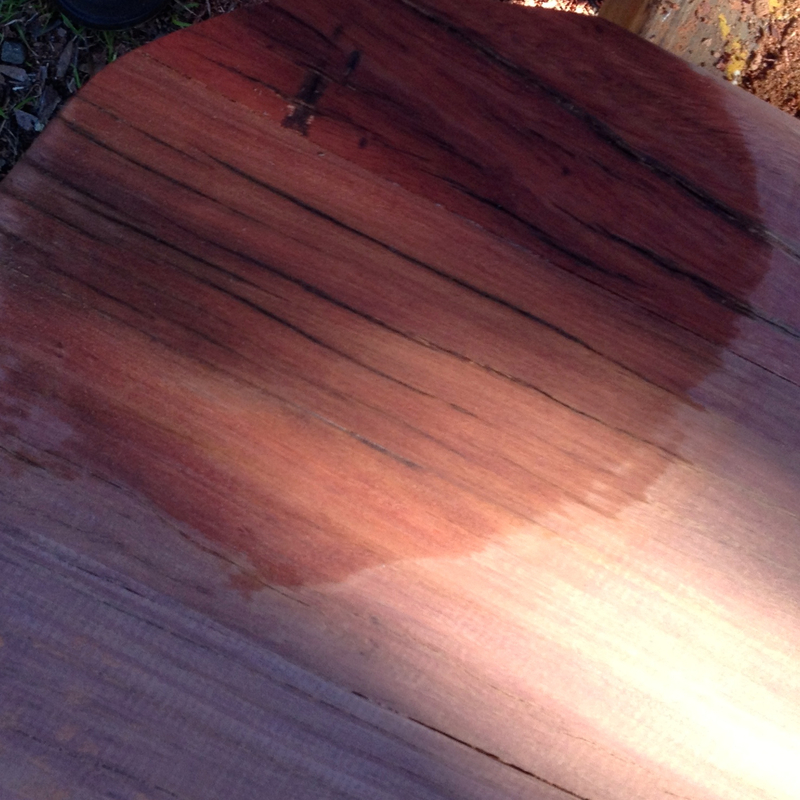 There was quite a bit of saw blade chatter marking on the board, especially near the larger of the two circles in the grain (where a branch would have originally grown). To completely eliminate these would have required taking about 2mm off which was impractical for a number of reasons. Hence the worst of the chatter has been sanded out before moving on to the finishing sanding. The end result is smooth, if a little ripply. Here are all the pieces waiting for final assembly – pretty much the last time this is going to look like a pile of parts. 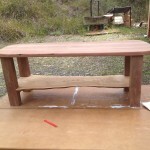 Here is the dry assemble – prior to drilling out the dowel holes in the top slab and the bottom shelf. Basically everything is just sitting, balanced on top of everything else at the moment. And on lower shelf – all still clamped up at this stage. Time to put it all away and let the final glue cure overnight! 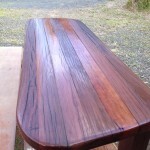 Once upon a time I started making a table out of reclaimed timbers. 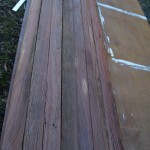 This project involves the trimming of gnarly old, hardwood deck timbers with saw and power plane. The power plane is a hugely important character in this tale, without whom we would altogether be at a loss. His name is RYOBI, and he is a fetching shade of bright green, and is about fifteen months old. One day RYOBI accidentally swallowed some cloth, which wrapped itself around the drum before his operator could stop him spinning. And so to the store where RYOBI was originally purchased; the local Bunnings Hardware. Here the friendly Tool Section man, Luke, advised that belts could only be ordered via the Special Orders Desk in the store. “Bah-Humbug to that” thought RYOBI’s operator, and he promptly went home to order one online instead. 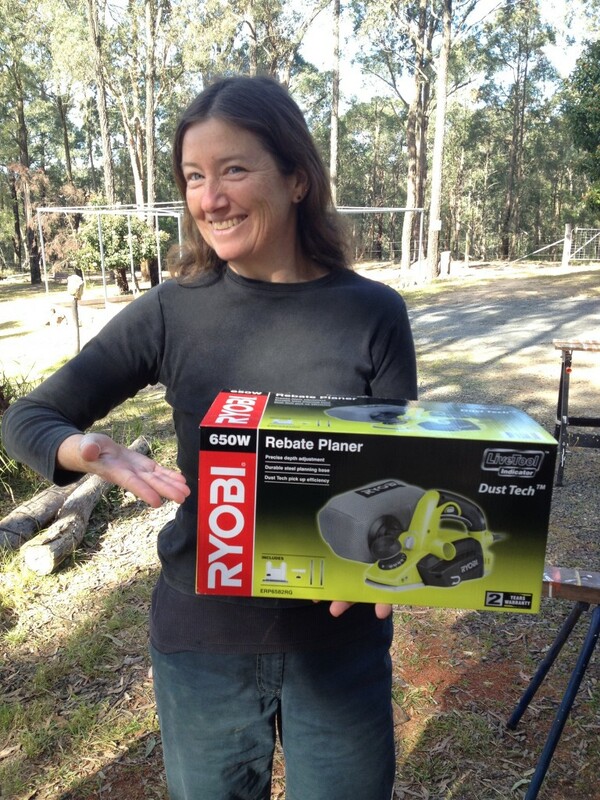 Here our story takes a dark and frustrating turn, as it turns out that the sole merchant for RYOBI products, including spare parts is in fact Bunnings. In fact the “Spare parts” page of the RYOBI Australia website is simply a store locator to allow you to find the nearest Bunnings outlet. Rather than head out the door again, RYOBI’s operator let his fingers do the walking and with a quick phone call later an order was placed for a new drive belt. 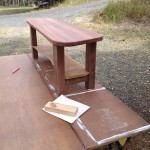 All seemed OK in the world, and RYOBI would soon be happily spinning again and helping with the job of making the coffee table. Alas, RYOBI was already fifteen months old, and the sales receipt had not been kept. Drat! Double Drat!! And furthermore…Botheration!! However a few days later, after much seething about the Wasteful, Throw-Away Society in which we live and the expense of having to buy a new planer in order to replace a perfectly good one RYOBI’s operator noticed that RYOBI’s original box documented that he came with a TWO YEAR warranty. Still no sales receipt, however usually such a store as Bunnings will do a product swap or similar on supply of the credit/debit card used for purchase. It transpires that the IT department was still doing whatever Central Bunnings IT Departments do to try and locate a purchase in their records, but that Luke had decided to Do the Right Thing and process it all as a product warranty swap, and worry about the paperwork later. Sad, not-really-broken-but-needs-a-new-drive-belt RYOBI was thus left with the lovely lady at the service counter and replaced with a brand, spanking new replacement model. Our story ends mostly happily then. The RYOBI company remains in the bad books for discontinuing a simple, user-replaceable part for a model of power tool that is still current and still being sold, and during the warranty period! Bunnings however demonstrated good customer service and sorted out the problem. I now have a brand new planer, with a two year warranty starting now, and a new sales receipt that I will file away for a rainy day. However I am still annoyed that what is basically a perfectly good tool chock full of metal and plastic and the embedded energy and other resources used to manufacture it is no doubt destined for landfill. Totally and avoidably wasteful! Grrr! 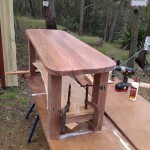 The top of the coffee table is now up to the next stage of the fun – shaping and sanding. 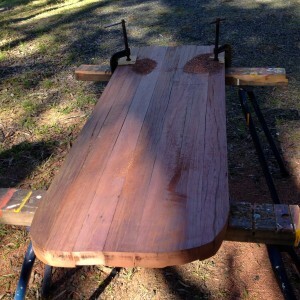 The now dried slab of boards needs to be flattened on both sides, be trimmed to provide the overall shape, have the edges rounded and shaped and be sanded in preparation for finishing. Therefore I’m embracing my lack of exactness to create something more organic in nature. 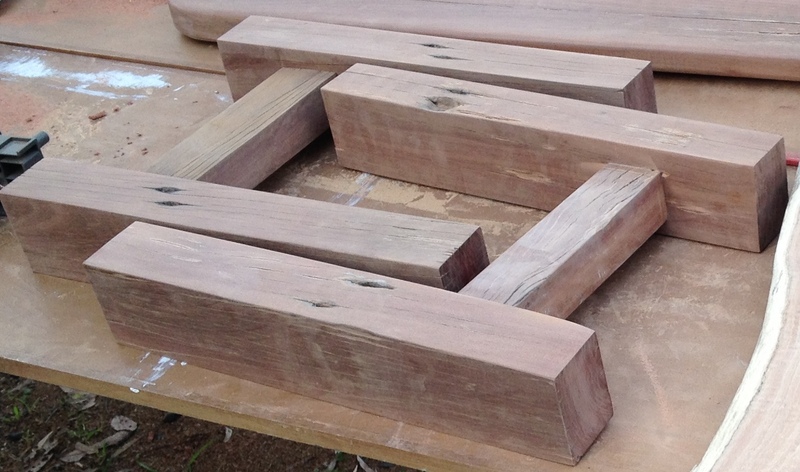 I also think this is more sympathetic to the nature of the materials I’m working with – reclaimed and reused timber. The plan then (ok – there isn’t really a plan I’m working from other than a picture in my head I’m working towards and adapting and improvising along the way) is to round off the corners of the glued slab. Most importantly these round corners will be hand drawn and deliberately be uneven left to right and end to end. Before shaping the ends the slab has been rough planed both sides to a more even width. 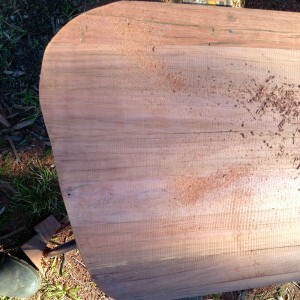 Next stage is to further plane both sides of the slab, and also shape the edges using the plane. Then on to the sanding. 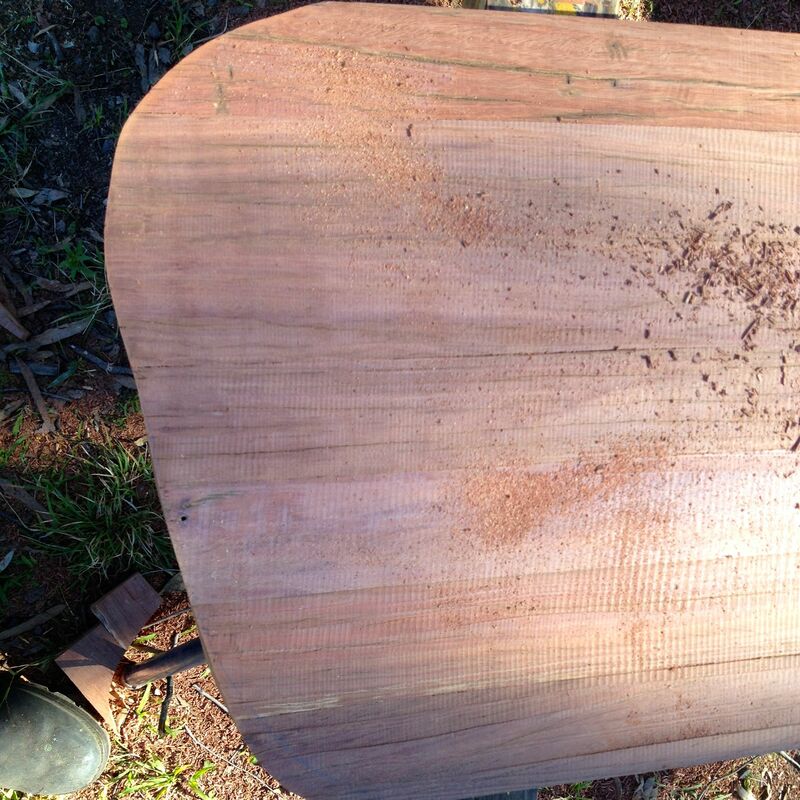 The rough sand is with P80 grade – again the well seasoned ironbark is playing havoc with the tools. Overall the rough sand ripped through about twelve sheets of P80, which each sheet losing 50% of the effectiveness as a sanding material after the first 60 seconds of sanding. 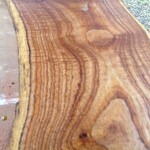 The left hand side of the slab in this photo has been rough sanded, erasing the worse of the planer marks. Lovely chocolate chip biscuit home baked yesterday by the Ladies of the House, and a quick few pages of The Bookshop that Floated Away which I bought as a birthday present for The Larger Loinfruit, and am now reading myself. 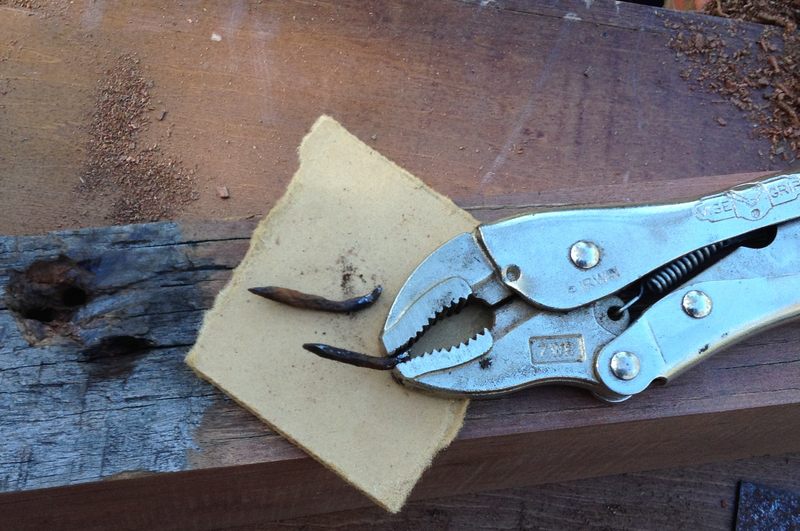 Note to self….be a little bit more careful when planing near bits of cloth. The good news is that I now also know much more about how to take apart a RYOBI power planer than I did before. The bad news is that getting the cloth out required decoupling the tangled planer drum from the drive wheel by removing the drive belt (so that the drum could be turned in reverse) and that when I did so the drum band was damaged. This subsequently led to the discovery that the ONLY way to order RYOBI spare parts is via the Bunnings Special Orders Desk. Sigh…. Time to glue all those timbers together into a slab to make the table top. Think “very large edge glued bread board” and you’re on the right track. Most excitingly this part of the project involves the purchase of a new tool; specifically a dowelling jig. 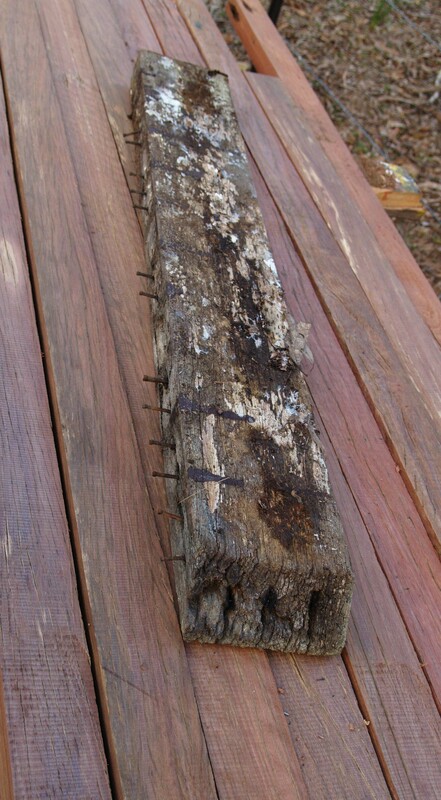 Firstly all the timbers have been sorted so that adjacent boards have a roughly matching thickness, with the thinner ones at the outside edges. 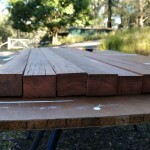 They’ve also all been trimmed to about the same length – approximately 1350mm. 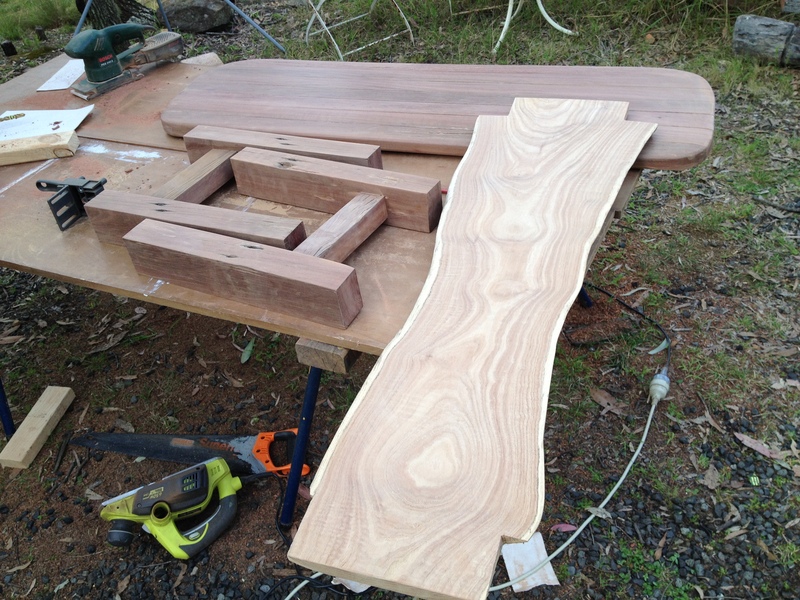 The length has been chosen to complement a White Cedar board that will later be used as the bottom shelf for the table, which is itself 1100mm in length. Each board is secured to the next with four dowel joints, plus PVA glued all along the edges. Sash clamps are courtesy of The Convener, who has an impressive selection to choose from in his awesome and impressive slabbed timber workshed (including some pipe clamps that are 5 metres long!). 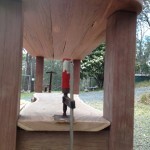 Each newly glued board is left clamped for about 45 minutes before the clamps are released and the next added on. All the boards have been predrilled ready for the dowels so that the clamps are not left off to long during this process. By the end of the day all seven boards have been glued and clamped tightly, and the slab then tucked away to cure for a few days. The boards aren’t all even, but that’s OK as the next step involves a load more planing and shaping.